Mixing Black an white strips with literally any print is a guaranteed way to work this trend. Not sure how to mix more complex prints? Try incorporating similar colors in the top and bottom of choice. Solange took a taupe printed high wasted pencil skirt, and matched it with a mustard blouse with hints of taupe. To pull the look together, she wore a neutral copper wedge. I know, I know....too much Solange, but I can't help it. This beautiful young lady bleeds fashion! In this look she choose to mix patterns in my favorite way. This look reminds me of the game "set." The colors are the same, but all the patterns are different yet clean. And check out those heels! AMAZING LOOK SOLANGE! Some of you may think this choice is a bit much, but I find it quite genius. This beauty fearlessly dove all in, mixing prints, colors, and fabric. 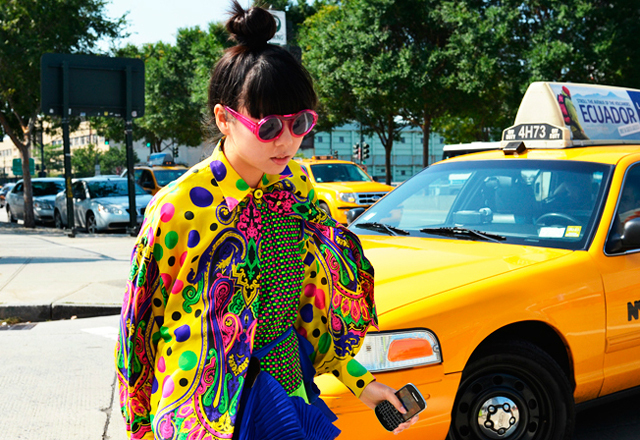 The addition of the pops of colors, highlighted in the patterns, makes this outfit a winner in my book. This look seems effortless, but please check out their blog for more detailed images. The black and white striped top is actually sequins which opposes the leopard textured clutch perfectly. The pop of red on her lips continue this daring, yet classic look. Thanks for sharing your outfit with us.